We stumbled upon a web site called „iMarkets Academy“ and we immediately recognized a binary options scam. Although the iMarkets Academy presentation is very short, it is full of warning signs that identify a scam. They are promising you to turn $250 into $1,583 every 15 minutes, which is impossible, it is a big lie. They also say that with iMarkets it’ fast, risk free and you don’t need any prior knowledge or experience. So basically free money for everybody… Scam! Trading is never risk free. Another obvious lie is the statement about 96,3 % of all traders doubling their initial investment within just a few hours. And have you seen the testimonials? They are fake, photos are from public databases, stories and numbers are complete fiction. So what happens when you sign for iMarkets Academy? You’ll discover that if you want to trade their system for free, you have to open a trading account with their unregulated broker and deposit money. Or pay at least $50 in fees. 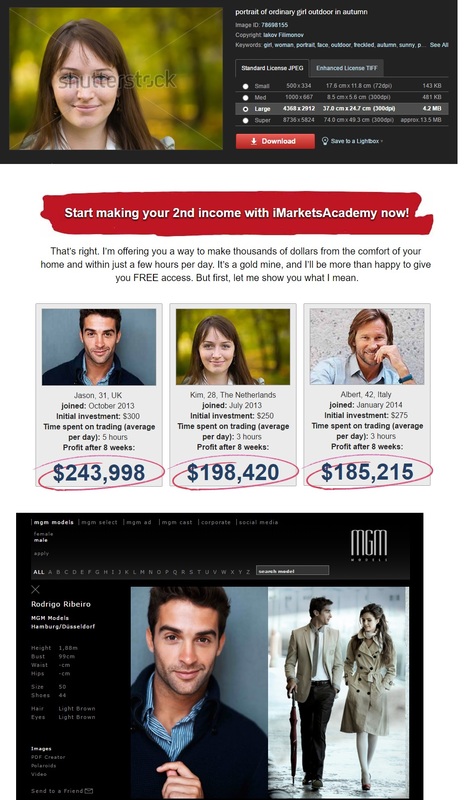 So this is a confirmation that iMarkets Academy is a scam. They are paid by their broker for referring new depositors and they don’t care that you will lose your money with their system. iMarkets Academy is an ordinary scam. It is not an academy or trading school whatsoever. It is a scam designed to push you to an unregulated broker. If you wish to try real binary options to see how it works and money is made in trading, do it on a really free demo account.